Gwynfa members have had 23 photographs selected for the forthcoming PAGB Inter Federation Competition. The images were selected from acceptances in the 2016 Welsh Salon of Photography. The Competition is being held in Belfast on 18th and 19th June and each Federation can enter up to 30 images in each of 4 sections:- Colour Print, Monochrome Print, Open PDI and Nature PDI. The images will be appraised and scored by a panel of judges, and the top 10 scores in each section will count as the winner of that section. The WPF have made an entry of 30 images in each competition. Gwynfa acceptance are listed below. A full list of all the images selected by the WPF can be found here. Having 23 images (out of a total selection of 120) is a big achievement both for the individual photographers and for the Club. Congratulations to all those who have had photos selected. Steve is on the buses. Gwynfa member Steve Lindsay has won a competition organised by Rhondda Cynon Taf Council ’s Tourism and Libraries alongside Stagecoach transport to celebrate the natural beauty, history and heritage of the area. 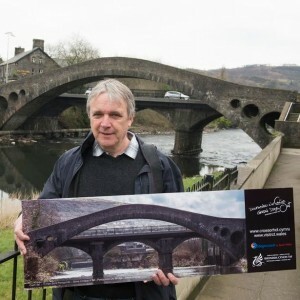 Steve will now see his beautiful shot of William Edwards’ 200-year-old Old Bridge, which was once the largest single span bridge in the world, on Stagecoach buses. 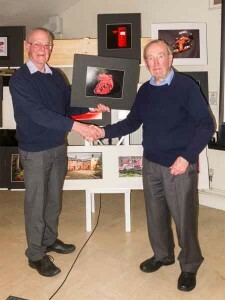 Alan Shepherd won the prestigious Jim Davis Trophy on the theme ‘Red’ with his print entitled ‘Red Rose‘. Top PDI went to Malcolm Garbett with ‘Dream Machine’. Runners up were Leigh Woolford with ‘Rosso Corsa’ (Prints) and Alan Hoskins with ‘Two of a Kind’ (PDI).